^^ I couldn't stop laughing when I saw this on Instagram. Why are you private, boo? I can understand if you want to keep your personal pages private, but there's no excuse to have your business social media profiles hidden. Social media is a way for potential clients and customers to get a taste of what it's like to work with you, so unlock those accounts and get to that coin! *Stop telling folks to email you to find out more about a product or service - Instead of doing this, you should set up a basic sales page to give folks details about how to work with you or more information about your product. You can use Squarespace, Samcart, Shopify, Sendowl, Leadpages, etc. to set up this up. Also, add a FAQ section to your sales page to cut down the volumes of inquiries you receive about your products and services. *Stop giving folks only one payment option - If you only accept payments using Paypal, consider adding Stripe for those who don't like using Paypal. Give people more options, so there's no excuse for them not to give you their coins. *Stop making it hard for people to contact you for offline opportunities -- Make sure you have your business email address on your social media profiles and on your website's contact page to "secure the bag" for speaking events, etc. Let me know in the comments what you will stop doing in the next 24 hours. Even though I have a love/hate thing going with social (really working on loving it more these days lol), I do understand how important it is for building and growing your business. Since Instagram will only allow one link on your profile and no clickable links on the actual caption, I want to show you how to get the most of this prime social media real estate. You can simply use one domain to link to multiple pages/links on your Instagram profile. This method is perfect if you have several pieces of content, opt-ins and products/services to promote on your Instagram page. 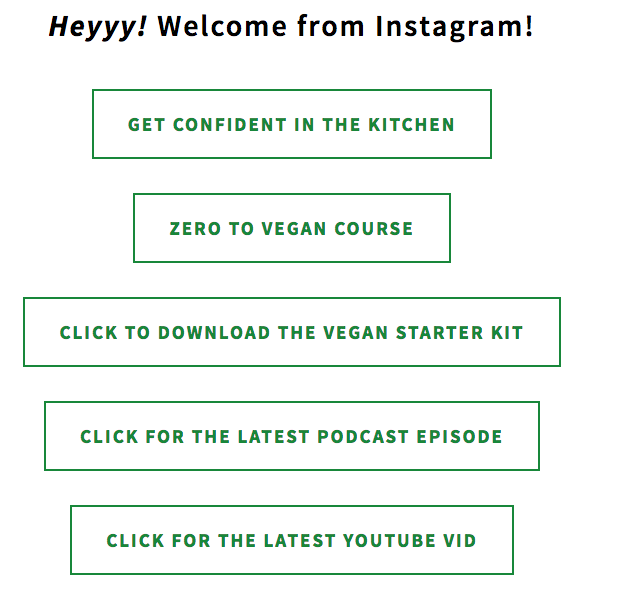 Here an example of how I use it on my Brown Vegan Instagram page. On both posts, I tell my audience that there's link on my bio to access the content. In the tutorial below, I give you step-by-step directions on how to just that. One of the main benefits to posting clips on social media (especially Instagram) is to entice people to watch my full video on YouTube and/or my website.